This week was full of lessons. Lesson One: Never trust an astronaut. Lesson Two: Everyone loves flowers. Lesson Three: We’ve grown a lot of plants in space. 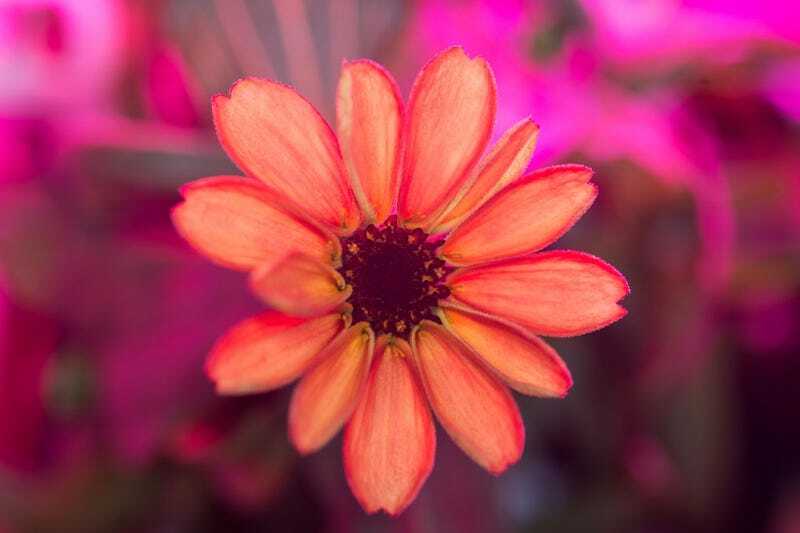 The first zinnias from the Veggie experiment on the International Space Station bloomed over the weekend, delighting us with their beauty and getting the internet excited about gardening amongst the stars. But we made a mistake: We trusted space-gardener Scott Kelly when he gleefully exclaimed it was the first flower to bloom in space. The orange delight pictured above was this astronaut’s first flower to bloom, but it was hardly the first flower grown in space. We get his excitement over plucking it and taking it to the cupola to see sunlight for the very first time. We completely sympathize with Kelly’s pride and joy that his orange bloom survived despite drowning, mold, and strict procedures that just didn’t work until he overrode them. We’re a bit less forgiving of NASA getting caught up and authenticating his claim—but hey, it’s usually their job to trust astronauts. But it wasn’t the first flower to bloom in space. It wasn’t even the first flower to bloom in the American space program. It was the first zinnia, the most photogenic bloom, and the first flower to sprout from the Veggie experimental setup, but without those qualifiers, most of the headlines you’ve been reading about space flowers—including our own—were incorrect. We’re sorry, and feel very, very bad about the error. As a silver lining, this is the perfect excuse to dive into a brief history of the beautiful plants that have blossomed far above our planet. One of my buds opened today and is in full bloom. Surprisingly, it does not open all the way but looks more like an inverted orange umbrella that got stuck at the halfway point. My spherical shaped stamens give off a tantalizing essence. My gardener did not tell his crewmates about this and kept me all to himself. Pettit took the zucchini flower in front of the camera for a two-way video call home on Valentine’s Day. He plucked the blossom and closed it in an Atlas, sealing it shut with Kapton tape and promising to bring it back. There was excited talk about my blossoms today. They were all looking forward to seeing little zucchinis in space. I did not have the heart to tell them one small detail. I make two kinds of flowers; male flowers with only stamens and female flowers that produce zucchinis. Being part of this all man-crew, it was fitting for me to make only male flowers. Sunflower has brown patches. His leaves are covered with dry, dark blotches. He is not happy. Gardener [Don Pettit] says it looks like a fungus. I am afraid that if something is not done we are going to lose Sunflower. The crew medical kit is designed for animals not plants so there are no medications for this disease. Gardener is treating Sunflower with a disinfectant wipe that has an antibacterial agent called BZK (Benzalkonium chloride). We do not know if this is going to work. Our spacecraft is designed for animals so life can be a struggle for plants. On the frontier, the answers are not found in the back of the book and sometimes you have to venture into the unknown and improvise. Sunflower is going to seed! His blossom is wilted-brown and has a few lopsided packed seeds. This is not quite normal, but then, we are living on the frontier and things are different here. They are not ready now; I wonder if they will be by the time Gardener is with his seed pod? But that wasn’t the very first space flower to bloom, either. In September 1993, NASA gardeners sent sprouted Arabidopsis thaliana into orbit on the space shuttle for a ten-day mission (STS-51). The flowers budded and bloomed, allowing scientists to compare shapes during growth, assess pollen viability, and evaluate any changes in the mature plants. They sent the same family of plants up again and again, even doing a full seed-to-seed growth experiment (with flowers but no picturesque blooms) in 2001. Later crews on Salyut 6 experimented with different plants and watering systems. One crew grew so enamored with their onions that they repeatedly questioned their ground-based botanist, Galina Nechitailo, about whether she really needed the entire crop. “Keep the four best onions for the experiment and use the rest as you like,” she finally relented, leading cosmonaut Alexander Ivanchenkov to shamelessly admit, “Thanks, I’ve been probing for that,” before he ate them. Yet they couldn’t quite pull off the elusive seed-to-seed success story. By August his journal turned gleeful as his overindulgence paid off. “Hurrah! A pod has burst: It spilt seeds!” he celebrated. In coaxing a batch of Arabidopsis to grow, thrive, blossom, and produce seeds all in microgravity, Lebedev became the first gardener to successfully grow a seed into a plant through germination that produced seeds again. We have no photographs to document his success, but after ten years of failures, Lebedev’s rockcress were the first plants to flower in space, over three decades before Scott Kelly’s declaration. After its historic victory, the Soviet Union’s surge to becoming expert space-gardeners hit a series of stumbling blocks with lost modules and crashed return vessels. The greenhouses on Mir were a step back in technology, more political than scientifically interesting. But this is when international collaboration kicked off. American astronauts and now-Russian cosmonauts grew plants into seeds, resowing them for the first multi-generational crops. Soon they switched from wheat to leafy greens, aiming to grow a garden salad instead of a loaf of bread. The astronauts became more skilled, arguing back with their terrestrial botanists about how to best care for their plants. Soon they had a crop of leafy Brassica rapa. NASA never cleared their space-gardener Peggy Whitson to munch on the field mustard, but her hand sneaks into a photograph of cosmonauts enjoying the fruits of their labors. These positive boosts to moral have been noted again and again with every little hint of green that sprouted in microgravity. Although the earliest research was driven by botany, today’s experiments also serve to investigate the psychological impact that on-orbit gardening has on astronauts. “The farther and longer humans go away from Earth, the greater the need to be able to grow plants for food, atmosphere recycling and psychological benefits,” Veggie science team lead Gioia Massa said in a NASA press statement. So here’s to the field mustard, the rockcress, the flax, the sunflowers, the lettuce, and yes, the zinnias, too. May you grow strong, little plants, prosper and flourish. Reproduce and be eaten by our astronauts. Pave the way for us to explore the stars.